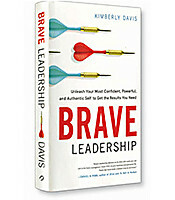 Kimberly Davis shares the transformative tools she uses in her leadership workshops, drawing from years of working with leaders of all experience levels and industries and the latest research in psychology, sociology, business and the arts. Brave Leadership bridges traditional business how-to with a personal development approach to demystify what it takes to be a brave leader in today’s ever-shifting world. Why focus, vulnerability, presence and connection are the keys to brave leadership. Tools to perform powerfully in a high-stakes environment. The difference between a goal and a Super Objective. To own your power and cultivate bravery.